Here is the Midwest USA we are in the midst of winter. Personally I love catching a glimpse of the birdies hiding out in the trees this time of year! I chose to try to re-create this with canvas art! These stamped canvases can be mailed as a card and so the receiver can then display it as art! Stamp and emboss the sentiment in the upper right hand corner. Spray resist spray through stencil. Add die cut branches to canvas. Stamp bird onto cardstock and fussy cut birds. Color bird with distress markers. Finish canvas by adding stamped bird to branches on the canvas! I hope this project inspired your inner muse! 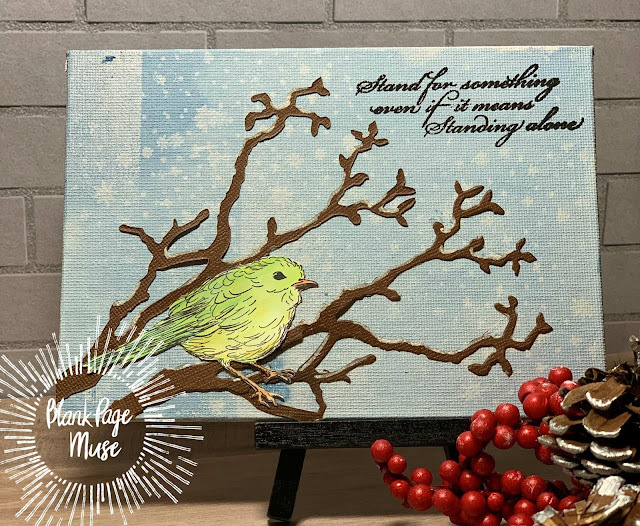 I love that you made a scene on the canvas highlighting the stamped bird! Fabulous inspiration! Chris I adore absolutely LOVE you canvas art! So wonderful and this one is no exception. Fabulous and thanks so very much!